The beginning of June is a very exciting time of the year for me. Not because school is coming to an end, but because my favorite week of the year is finally within reach. 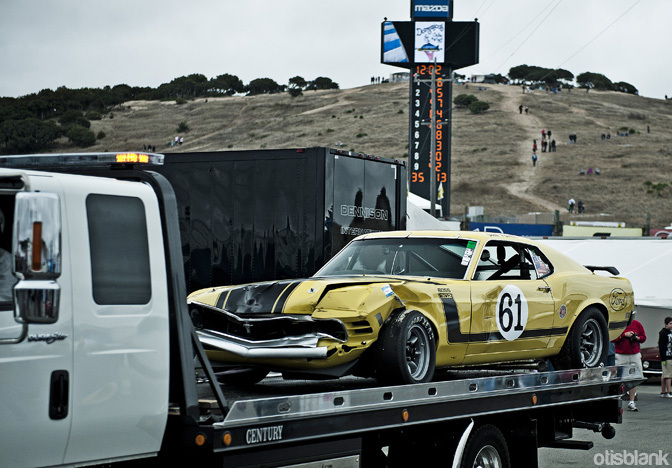 That week is Car Week in Monterey. I have been fortunate enough to be able to attend the last few days of Car Week for the last four years, and I’ve never been let down. 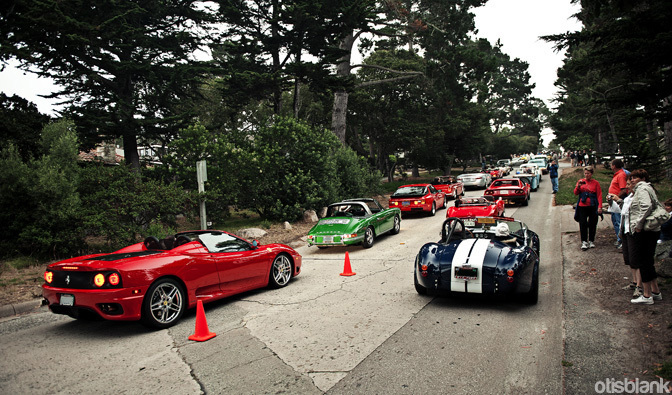 Monterey in mid-August is a petrolhead’s dream. 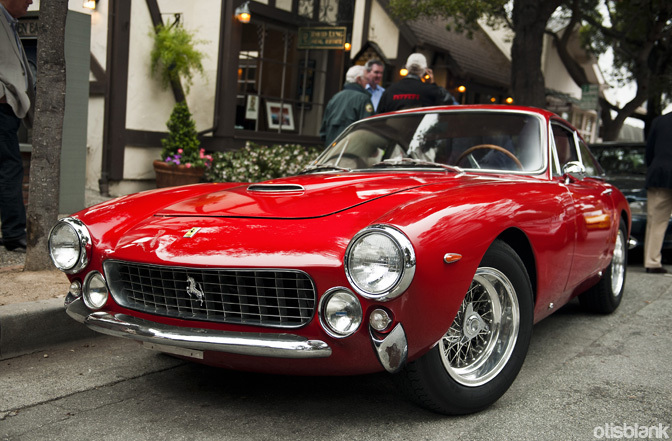 The whole Monterey Peninsula becomes, pardon the cliché, a “Mecca” for car enthusiasts. My yearly pilgrimage to Monterey always starts with a visit to Carmel, a small town in the Monterey peninsula home to the likes of Clint Eastwood, Ansel Adams, and the famous (to Car Week regulars at least) Ocean Avenue. Ocean avenue becomes a continuous parade of cars of all sorts. Vintage exotica like the above Ferrari Lusso are almost a common sight here. 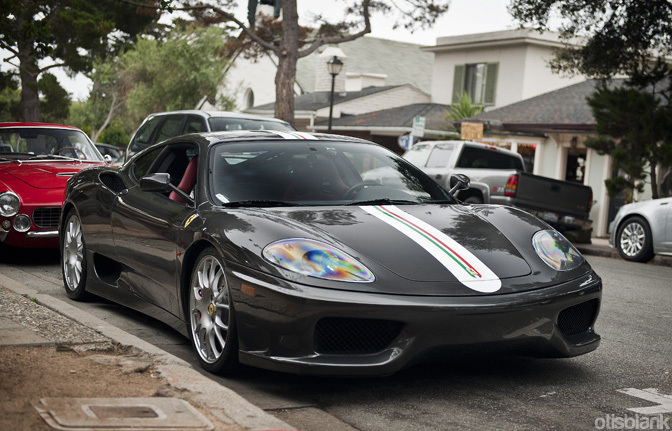 When Ferraris are as common as Corollas (there were at least three more within a stone’s throw of this one) it’s not a matter of just seeing a Ferrari, but more a matter of seeing a Ferrari with an unusual or rare color combination, like this 360 Challenge Stradale. Any form of dark grey on a red interior does it for me. 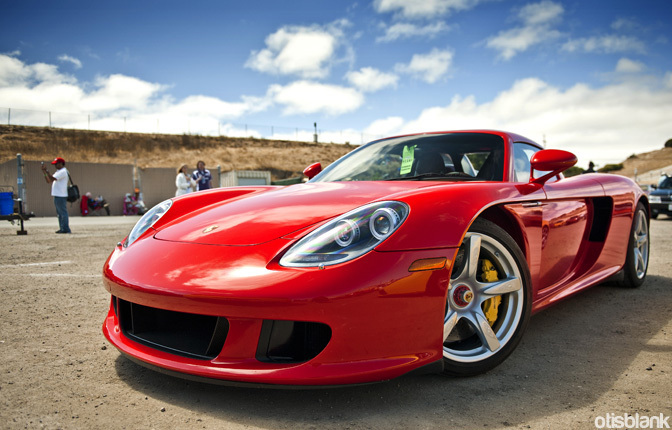 Every year on the Friday of car week, there is a small car show on Lighthouse Avenue in Pacific Grove. The cars from that show all cruise over to Carmel for a last parade up the avenue. The sheer variety of cars makes it quite a spectacle! After the parade it was time for one last scan of the avenue to see what I might find hiding on some of the side streets. 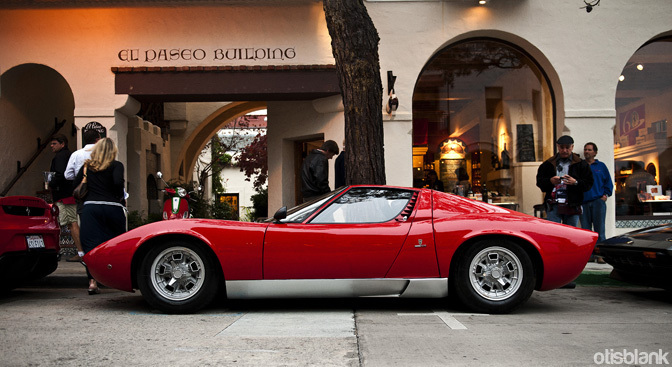 This little excursion revealed this classic beauty, a Lamborghini Miura, which almost unsurprisingly was surrounded by Ferrari’s. 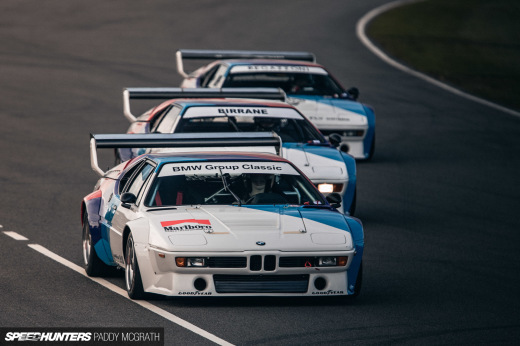 Once Saturday rolls around it’s time for what some might consider to be the best event of the weekend, the Rolex Monterey Motorsports Reunion at Laguna Seca. After the long walk from the parking area, I was greeted by a flurry of classic Ferraris. 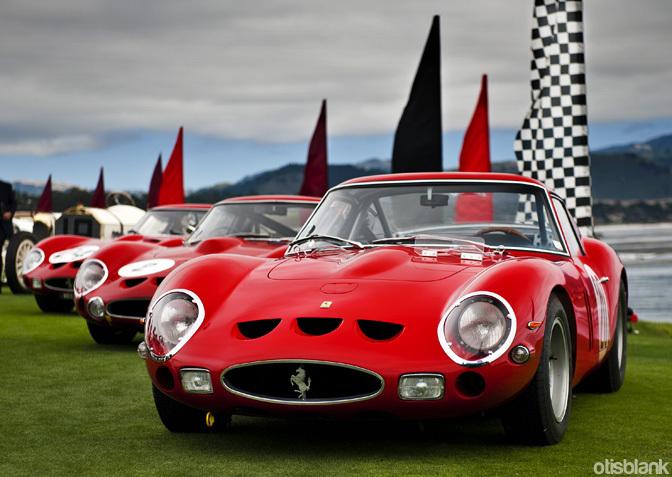 This group largely consisted of fine examples of the legendary 250 GTO. After being mesmerized by the vintage Fezzas doing their practice laps, it was time to head into the paddock area to see all of the amazing cars being prepped for their respective races. As I walked into the paddock, so did the Ferraris as they made their way to be fine tuned for optimal track performance. 2011 marked the 50th anniversary of the famous Jaguar XKE and to help celebrate, the featured marque at the Motorsports Reunion was, naturally, Jaguar. They had the latest and greatest the brand has to offer including the magnificent XK-RS you see above. 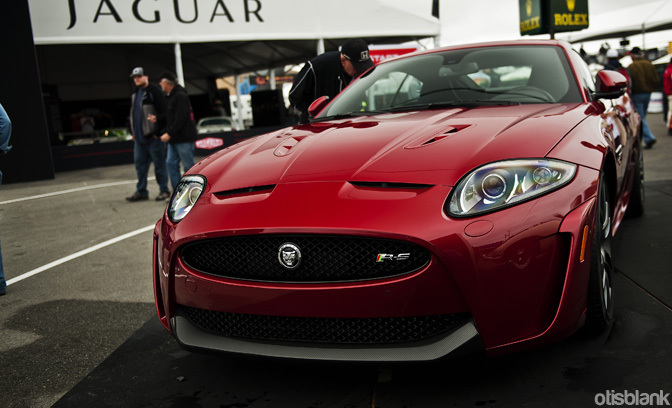 Laguna Seca was also crawling with brand new Jaguar XJ Supersports shuttling VIPs around the track area. 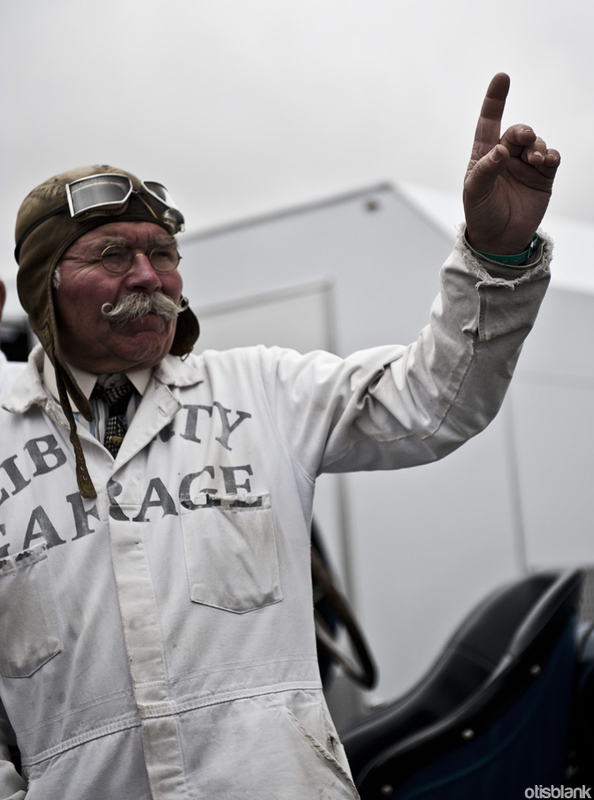 But the Motorsport Reunion is not about what’s new in motorsport; it’s about the bygone eras of motorsport. As you can see from the above photo, some people get very into it. It is very common for drivers at this event to not hold back regardless of the value of the car they might be driving. While this is fantastic fun to watch, it doesn’t always end well for some of the drivers. Gaudy chrome bodied cars might be relatively commonplace in places like Dubai, but this stunning and unique Aston is a prime example of a chrome body done right. This is due in part to the fact that this car isn’t wrapped, that’s the bare aluminum that makes up the skin of this beautiful machine. Once you cross the bridge from the paddock area that takes you near the lake that gives this famous race track its name, you will find yourself in the car corral area. This area holds a wonderful assortment of machinery. The car corral could easily be its own show. 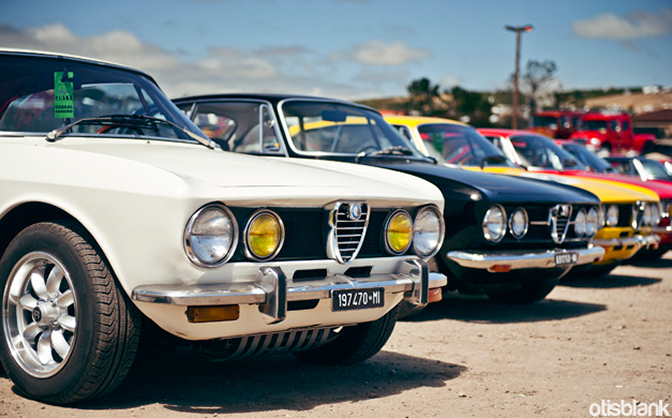 The corral always has a good representation of Alfa Romeos, and this year was no exception. 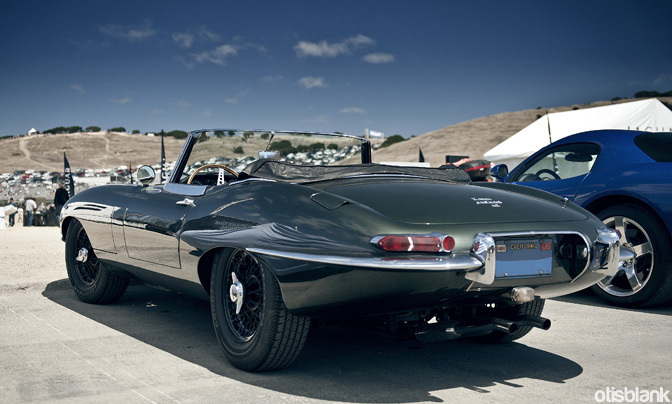 This year, the corral was also home to what must have been at least 100 E-types. The above Jag was one of my favorites with its unusual black wire wheels and somewhat sober color. This was a welcome change amongst the many XKEs present that were painted bright red. After spending several hours enjoying the Reunion races, it was time to head back into town to check out what might be floating around. I first went into a parking garage which I know to be a great place to find exotics. The first car I saw when I walked in was a red Ferrari 599 GTO, an awesome start. As I continued my way up the aisles of cars what should I see snarling back at me but a brand new Lamborghini Aventador. This car literally stopped me in my tracks. This being the first one I’d seen I was stunned by how aggressive it looked. 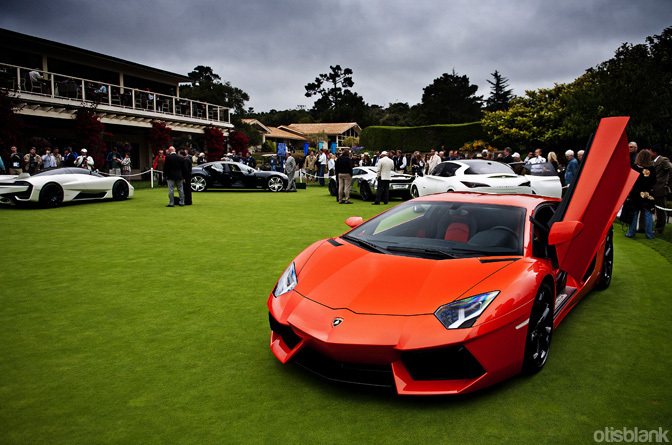 Sunday brings what I consider to be best event of its kind in the world; the Pebble Beach Concours d’Elegance. Before you even get to the famous 18th green at Pebble Beach where the main event is held, you make your way through various tents set up by the sponsors of the Concours. 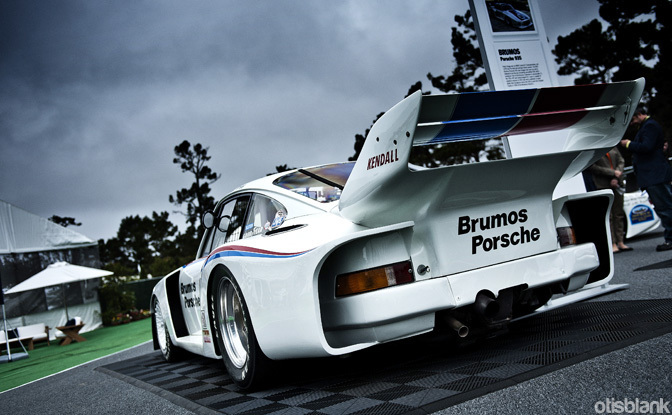 Porsche brought out a myriad of great cars this year, including this incredible Brumos Porsche 935. Once you’ve made it through all the sponsor tents, you find yourself at the concept car green where manufacturers have brought their latest concept and flagship cars to show off to Concours attendees. 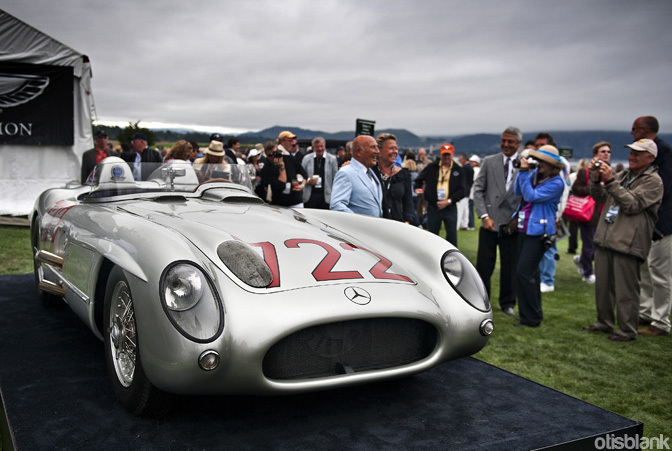 This is the famous number 722 Mercedes 300SLR that Sir Sterling Moss famously drove in the 1955 Mille Miglia. The eagle-eyed among you will notice Sir Sterling himself standing beside the car with his wife. 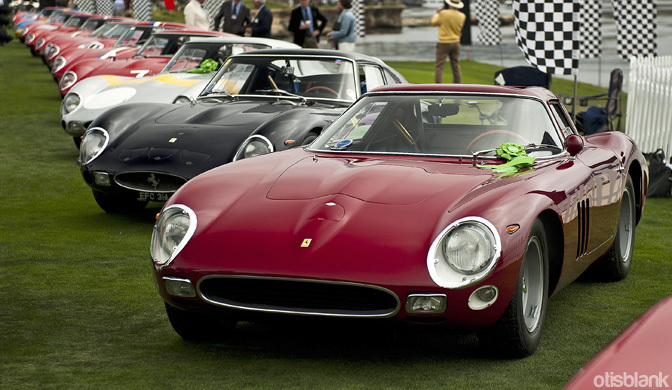 This years Concours brought out Ferrari 250 GTO’s from all over the world. 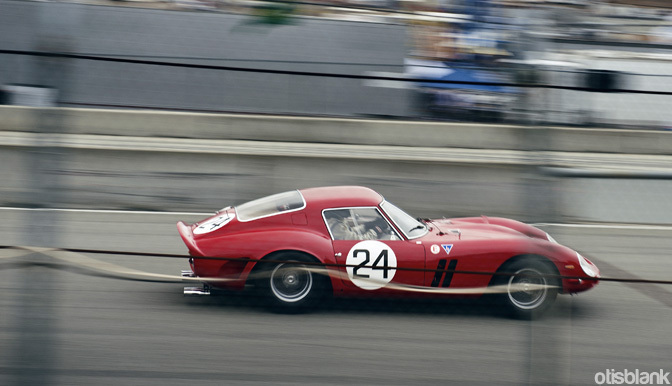 Every sort of GTO imaginable was present, including the original 250 GTO prototype. 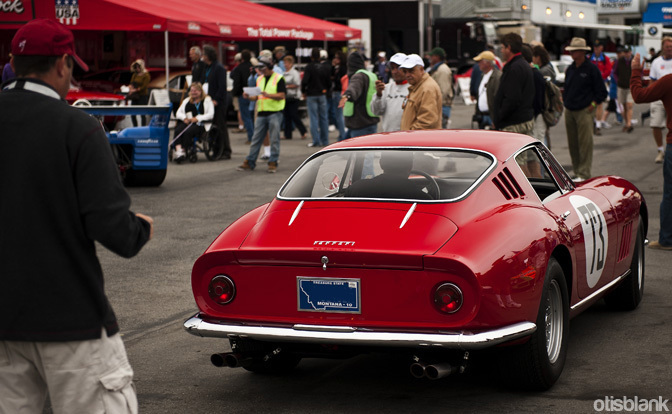 There were also a few Series II bodied 250 GTO’s like the one you see above in dark red. Well that about does it for Monterey experience! 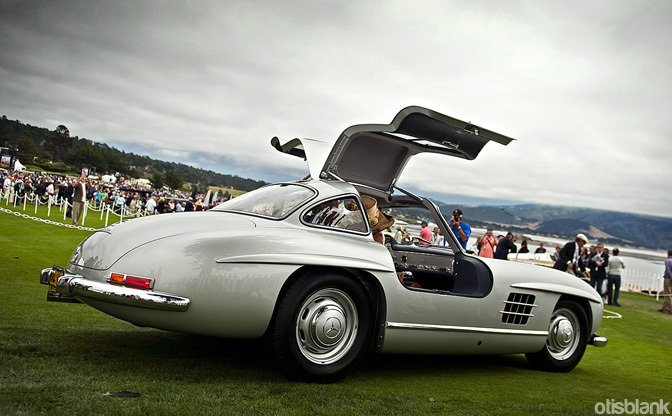 I’ll leave you with this perfect example of a 300SL Gullwing driving at full wingspan, which it has every right to do. I hope you enjoyed my perspective on car week! OK, I NEED TO KNOW THE MODEL OF THAT ASTON. RIGHT. FREAKING. NOW. FYI there is no "lake that gives this famous race track its name". Laguna Seca means 'dry lagoon'...the track was built in a dried-up lagoon. There just happens to be a little bit of water still left over that forms a small lake (more like a pond actually). not only are the cars perfect but so is the grass they're parked on! @hushypushy: Apologies for the inaccuracy! Thank you for clarifying. @Lautaro: There are 1280px wide versions on my website, if you need bigger than that you can shoot me an email! That first shot just blows you away. Great coverage of what seems like a great event. Almost as good as Goodwood we have over here in Blighty. I jest of course. Added to my list of event to see before i die list. the selection of car there is truly incredible!! That chrome Aston is probably my favorite photo of this lot, so unique & odd, yet it works. I've always wanted to go to Car Week in Moneterey, it's one of things that you have to do as an enthusiast, at least once. It would be great to drive down & stay for the week, going to all the events. You really have to appreciate the form and beauty of older cars. Don't get me wrong, present day vehicles are pretty cool, but nothing out there is like the old school. 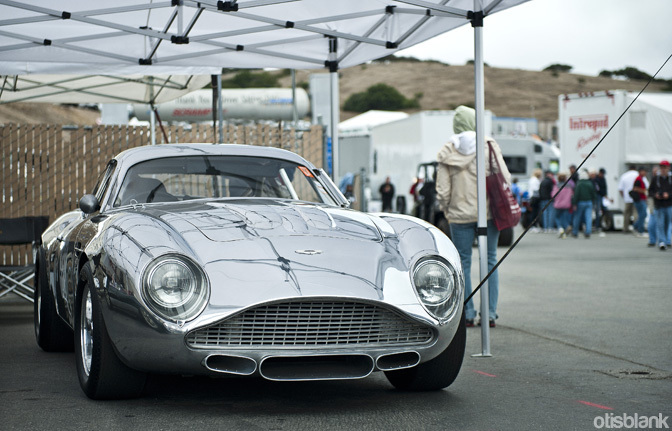 I'm not sure what the story is on the Aston but I do know it is Zagato bodied. My guess would be that it's a DB4. 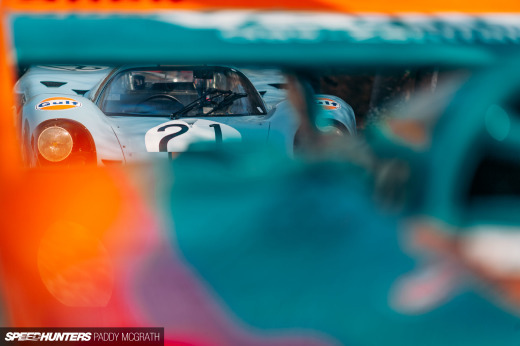 There are tons more Monterey photos on my website if any of you are interested! love the Aston.. looking anything but gaudy! Yes! What is the model of that chromed Aston? Magnificent article and photos, thanks! ohhhh maaaiiiii .... what a great post!!! Any pics of the Shelby Tuatara I see in the background? ah man why cant they be high res! that lead pic of the ferraris needs to be on my desktop, now! PLEASE! I need a desktop of that first picture!!! It's just beyond epicness!!!! PLEASE!!!! Colours, lighting, composition.. absolutely stunning!